This past April, after ten years with Seakeeper, Semprevivo was named president and CEO. He and his wife, Joanne, live near Seakeeper’s headquarters in rural Pennsylvania, but the kid from the Jersey shore still keeps a boat there. He returns to the area often to boat and fish. We caught up with him to learn about the latest developments at Seakeeper. Q: Tell us about your rapid trajectory to CEO. A: Everyone wears a lot of hats when you’re in a company that is small and starting out. One day I was the service manager, another day I was the tech, the next day I was sales manager and eventually I started making sales calls. I really started to set up the global support structure, both sales and service. We decided that we wanted to do a factory-direct business model. I lived in Europe for a period, supporting our initial customers with sales and service. As our team and network of builders grew, I moved into the VP of sales and marketing position and, two years ago, into the chief operating officer role. I was responsible for all day-to-day operations. Four months ago, I was named president/CEO. Q: Seakeeper has enjoyed tremendous growth in the past few years. Can you tell us about that? A: We have been increasing shipments by approximately 40 percent each year and our growth has been fueled by a few things. The legacy product we launched in 2008 has gone from a luxury niche to a must-have item. It’s expected by the consumers. If you’re looking for a 50- to 70-foot sportfish or yacht, you’re not asking if Seakeeper is offered. You’re expecting it on there. We’re on 60 percent of the new boats in that size range today, so we have seen sales in those markets increase each year. A lot of growth in the last year has also been fueled by new products designed for smaller boats. That’s a much bigger market in terms of overall production numbers. Q: What kind of numbers are we talking about? A: This year we’re aiming to ship 2,500 units. We’ve installed well over 6,000 units since 2008. Those numbers show the recent growth trajectory. A: That was a path we decided on in the early days. It’s a much quicker route to market than selling through distributors. We decided we wanted a global brand and pricing consistency. We wanted to make sure we could sell and service the product at the bar we wanted to set. We now service all 350 OEMs factory direct. Q: How rewarding is it when you see a person who suffers from seasickness get on a boat and experience a Seakeeper? A: It’s why I’m here. It’s why a lot of people in this company are here. That moment when you engage that gyro and the boat does something that people never believed was possible is rewarding. I don’t get seasick, but the way I use a boat has changed dramatically since I got my first Seakeeper. I have my own boat and do not want to go out without a gyro. You get so used to the experience of being on that stable platform, walking around on deck, enjoying a drink with your wife or fishing with your buddies. It changes the experience of everything you’re doing on the boat. Q: Has the growth of the company been rewarding as well? A: We’ve created a lot of jobs at Seakeeper. We employ almost 200 people and have approximately 125 partners around the world that we’ve also created jobs for. We believe that this product helped the industry recover from the recession. We see how it has changed the boating experience and fueled the desire of many people to buy new boats. Q: Has most of your growth been from word of mouth? A: The product sells itself once you experience it. You hit that button and it’s a Wow moment. A salesperson doesn’t have to explain what it’s doing. It’s immediate and dramatic. I always feel like describing the product is a little vague. Sure, it’s a great product that our engineers designed, and production team puts out. But there’s so much that comes from getting people to experience it in person on our demo boats. We have five demo boats and we’re doing 150 events per year to have these boats in front of people. When they have the experience then they get it. Seakeeper is on a dramatic growth trajectory. This year it’s on track to ship 2,500 units, more than a third of total shipments since 2008. Q: You recently opened an office in Italy. How important is it to maintain the relationships with companies that supported you early on? A: We’ve had a presence in Europe since day one. If you circle back to our early days, we were 90 percent international and 10 percent domestic in terms of sales, so we have been servicing the largest builders over there since the beginning. We wouldn’t be where we are today without them. The office in Italy will allow us to continue to support builders in sales, applications and engineering, as well as making sure we have spare parts readily available so we can get a boat up and running in 24 to 48 hours. Q: Who were early supporters in Europe? A: Azimut was the first. We worked with Princess in the early days as well as Ferretti, Beneteau Group, and Fairline, to name a few. Q: Which Seakeeper unit is most responsible for putting the company on the map? A: The M7000 was the first product released in 2008. That product is now the Seakeeper 9. It was our first entry product for all key builders and enabled us to launch smaller products. 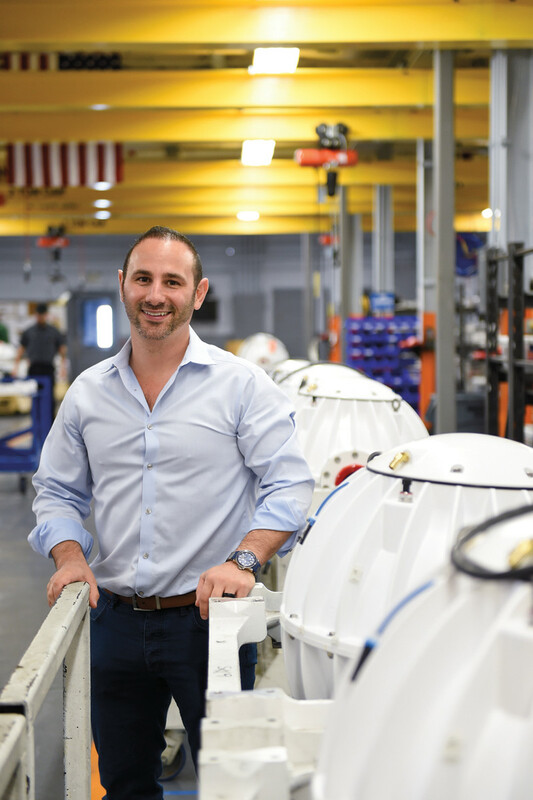 When you say, “putting the company on the map,” I really think our coming-out party was the release of the Seakeeper 3, the first product designed from the ground up to be used on outboard boats without generators. That’s where the vast amount of boats are. That product really changed the way the market saw Seakeeper. Q: Which unit is your best seller? A: The best seller today is the Seakeeper 6, which serves the 40- to 50-foot market. Just given the amount of boats built in each size segment, our smaller units will be our best sellers. Q: Will we see a Seakeeper for boats under 27 feet? Is there a size and cost limit that makes having one of these impractical? A: As the size, cost and weight of steel and aluminum come down there will be ways to serve the smaller-boat market. Our vision is to forever change boating. That’s by bringing the product down for entry-level boating. If we can make boating on a 21-footer a more enjoyable experience by removing seasickness and anxiety, more people will stay in boating. Then we’ll help grow the industry. A: Our system is composed of a sphere. 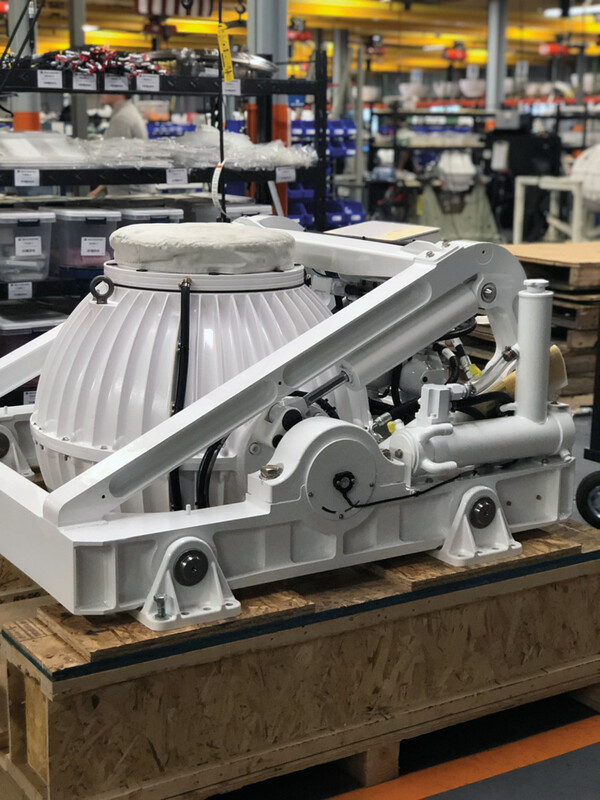 Inside the sphere is the flywheel, spinning at a high rate of speed in a vacuum—because that’s the only way to get the power, weight and size down for small boats. There’s nothing controlling the gyro. It’s natural physics. As the boat rolls, the gyro exerts the torque and prevents rolling. We design and manufacture everything in house. Q: How many boatbuilders have made Seakeeper stabilizers standard equipment? A: There are single-model standardizations across several brands now, and we’re adding more all the time. Most recently, Scout Boats standardized Seakeeper on two of its models and Bertram Yachts standardized us across its entire fleet. We’ve worked with approximately 350 different boat manufacturers around the world. Q: What are the biggest misconceptions people have about a Seakeeper? A: The biggest misconception is that the product is only available for big boats. The other is that it’s just for seasickness. We surveyed owners about why they purchased a Seakeeper and under 20 percent attributed it to preventing seasickness. Most people purchase our units because they provided a dramatic difference in the boating experience. Q: How satisfying is the company’s growth to you? A: It’s satisfying in so many ways. It’s great to see the jobs we’ve created, and to watch the people—people who took the risk of joining—growing. I made promises about opportunities that would present themselves. It’s great to see how those people have flourished. Many people told me in the early days: ‘I can’t believe you left Viking to do this.” But the great relationships and growth we’ve experienced have made it so worthwhile. Q: That kind of enthusiasm about going to work every day must be infectious. A: If you’re not enjoying what you’re doing, you’re doing the wrong thing. We’re not just selling a better mousetrap. We changed an entire industry. This team is responsible for creating that change. So many companies come out with technology and have instant overnight success. For us, doing American manufacturing in rural Pennsylvania with our machinists and assemblers didn’t mean overnight, instant success. It has been 10 hard years we’ve been at this. We’re still entering new markets, and I have to say it is fun overcoming the same challenges we had years ago. 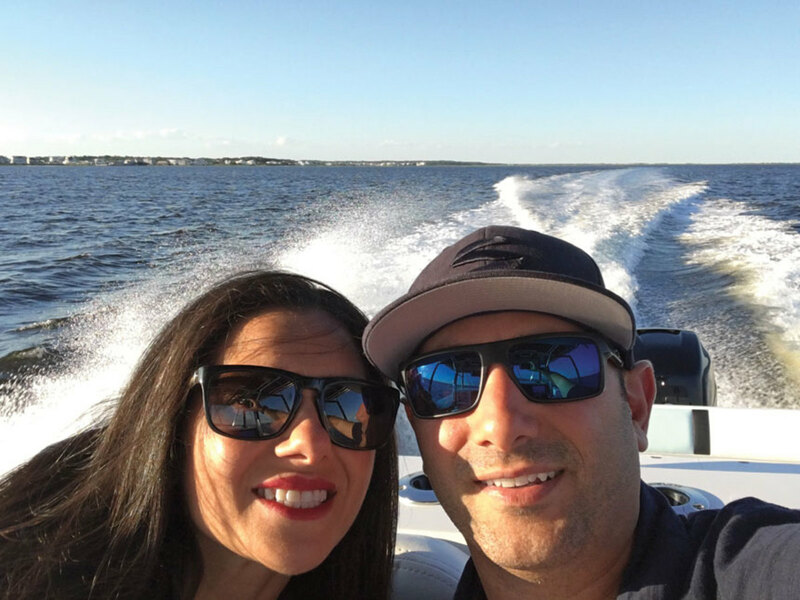 Joanne and Andrew Semprevivo on their home waters in New Jersey. Q: How about you personally? Where did you grow up? A: I grew up in Little Egg Harbor, N.J., and I still weekend and summer there. I’ve trekked millions of miles and, as they say, there’s no place like home. It’s where I still continue to boat. Q: What type of boating do you enjoy? A: I have a 28-foot Bluewater. Of course, it has a Seakeeper and is powered by twin Evinrude 300 E-TEC G2 outboards. Q: Is fishing your primary on-water activity? A: I primarily enjoy fishing, but I also like recreational boating, like taking family and friends out to dinner. A: Now that I’ve moved into Pennsylvania, I’ve picked up mountain biking. I ride a Cannondale Bad Habit full-suspension bike. I used to ride a Trek road bike with a group when I was at Viking. Mountain biking is a completely different animal. Q: How big is the primary Seakeeper facility in Pennsylvania? A: Our manufacturing plant in Mohnton, Penn., is 120,000 square feet and we are in the process of looking for a bigger space. We also have a facility in Maryland for administration, finance, service and marketing. We have another facility in Fort Lauderdale for marketing, service and sales. As mentioned, we have an office in Italy and personnel in Asia, the U.K. and Germany. Q: Are your products also being used in commercial and military applications? A: Our focus in the early days and, up until last year, has been the recreational market. It’s just a faster decision cycle because you can get units in the field, get hours on the units and learn more about them. Last year, we released a line of products for commercial and military use. Those guys can’t say: “It’s rough today, so we’re not going out to save someone.” They have to go out. It’s a great opportunity when you think about a pilot boat where the captain is stepping off and climbing a ladder. It’s a great application for Seakeeper. The commercial and military line has the HD designation on the website. Q: Your website says 25 percent of Seakeeper’s business is refits. Is that number still accurate? A: It has grown slightly and will increase. When we say 25 percent of the business is refit, that doesn’t include current owners upgrading to new product. The refits are boats not equipped with our system. That market will grow for two reasons. One is that we introduced the small products so they can be installed at deck level. Rather than cutting up boats and building in structure, you can buy a leaning post with a Seakeeper foundation. The second reason is that when we launched in 2008, none of the boats were designed for our products. Now, if they’re getting installed or not, new models often have the space built into the boat, so refit installations are getting easier. 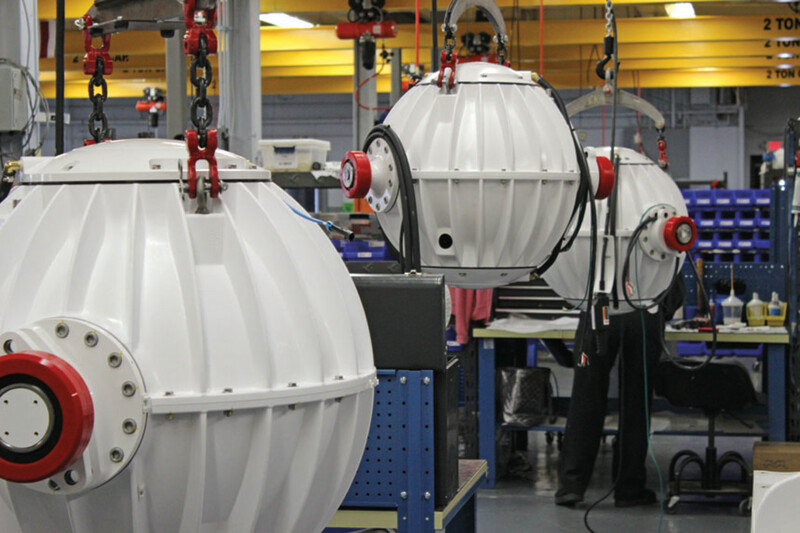 Semprevivo inspects the inner workings of a Seakeeper gyro. Q: How many patents does Seakeeper have on the technology? Has anyone tried to copy your products? A: We have patents on the vacuum-encapsulation, but there are always ways around patents. What we have is cultural IP. In the more than 16 years since the company started, we’ve figured out how to manufacture to the tight tolerances required. We know how to sell, service and market the product. We’ve built relationships with suppliers and builders. If you look at Kleenex and Thermos, or other companies that set brand recognition, we’re doing the same thing. Seakeeper is becoming synonymous with stabilization. We have a 10-year head start on our competition. We’re not complacent with that. We’re continuing to make the product perform better. Q: Does the fact that people consider Seakeeper a “high-tech” product make it easier to attract younger employees? 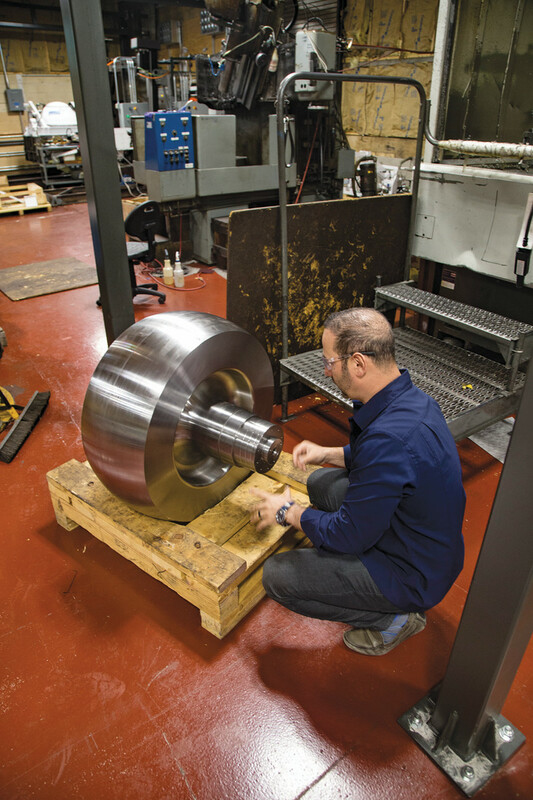 A: We engineer everything in-house from the hydraulics to the drives to the motors and the mechanicals. We’re pushing tolerances that even aerospace isn’t doing. We find the right people to embrace those challenges. We’re fortunate in that we’re able to recruit and retain the best talent. We recently put together a full HR team for recruiting and retention, and I think we’ve done a good job going out and targeting the absolute best—not only in the marine industry, but people outside the industry. For example, we’ve brought engineers from the auto industry in Detroit into our organization. We face challenges with the location, but bringing people into a smaller organization that is nimbler and more creative can help with retention. Q: Does the wow moment help when you’re recruiting? How about when you’re pitching vendors? A: It absolutely does. We do that with recruits and the vendors we want to target. It’s one thing to put up a PowerPoint presentation and have all these flashy numbers. It’s another when you hit that button on the Seakeeper. A: It’s not at all intimidating. I’m very fortunate to have worked close to Shep on a professional level and have a great personal relationship. Shep and John have been amazing mentors and friends. Shep is a tremendous visionary of the future. He did that with Hinckley’s Picnic Boat. Later, Shep and John did the same with Seakeeper. I would not be CEO without their guidance. They’ve done a great job continuing to add value to the organization and allowing me to run the day-to-day operations. Demand is pushing Seakeeper to look for more production space. Q: What do you see as the biggest challenges facing the marine industry? A: I hope the tariffs are going to be short-lived. But the positive is that we’ve had fuel on the fire for innovation for the last 10 years. We’ve seen it from motors to electronics to boat design and in larger boats. Companies are doing extraordinary things. That needle has moved more than it ever has, and I hope it continues. Q: Does Seakeeper have plans for other products outside of stabilization? A: We have such a talented team I believe we could do anything from the ground up, just like we did with the gyro. I was at an event recently that was about staying focused on the core of what your company set out to do. We changed boating forever. The way we can make the most impact now is by doing more with stabilization, basically by continuing to refine the product, and get it as small as possible. It took quite a bit before air conditioning in cars became standard. But you wouldn’t even think about that today. With Seakeeper taking that same position in boats, it’s not a matter of if, it’s a matter of when.